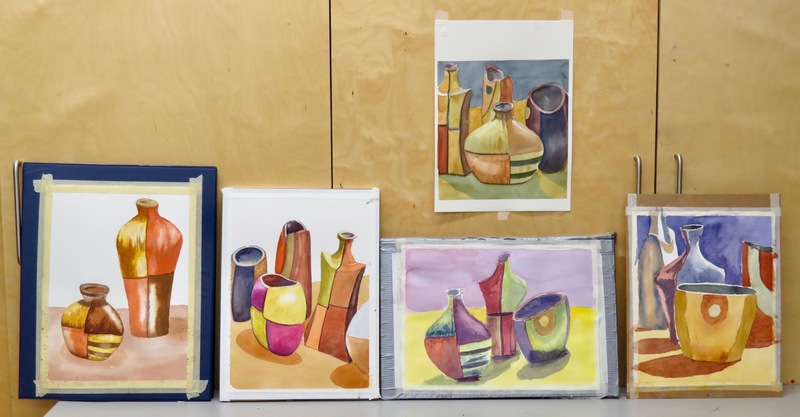 Wednesday Watercolour Class at DVSA – Week One! 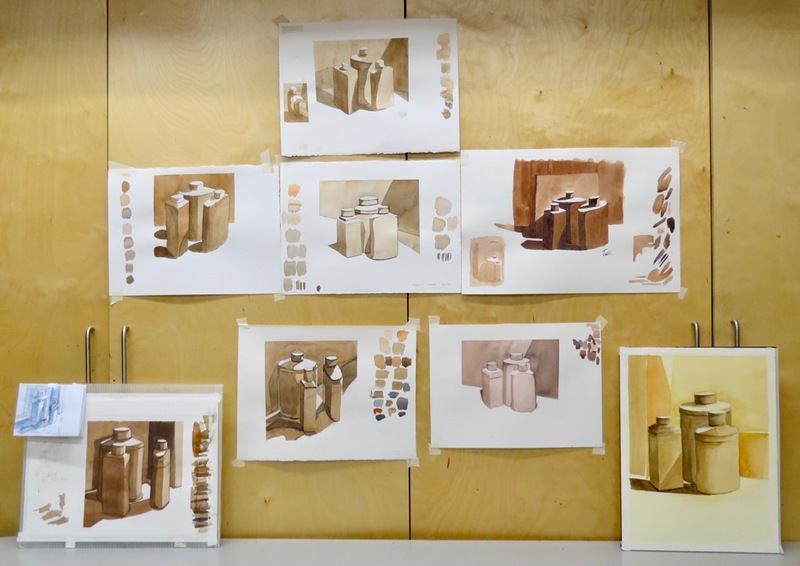 Last night, I was at the Dundas Valley School of Art to teach Watercolour: Concept and Technique. 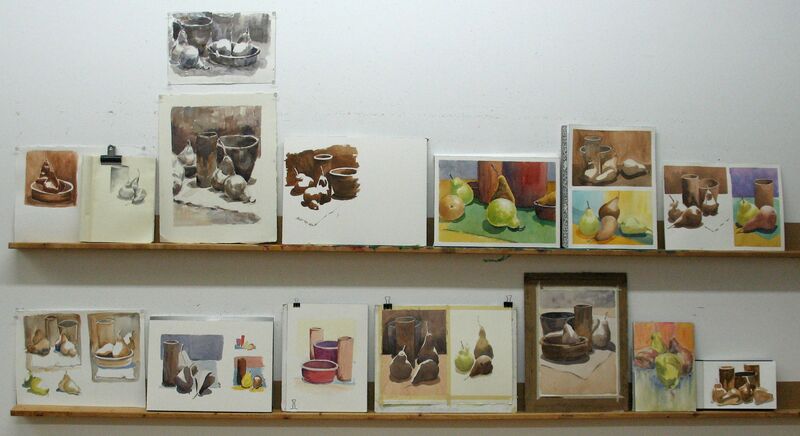 This course, based on observation of the still-life, is comprised of eight evenings and we got off to a good start. I didn’t discuss or demonstrate anything to do with watercolour technique. Rather, I focused on finding a composition with a thumbnail sketch/study. Thumbnail sketches are a very helpful part of the process. They don’t have to be pretty. They’re tools; not masterpieces. 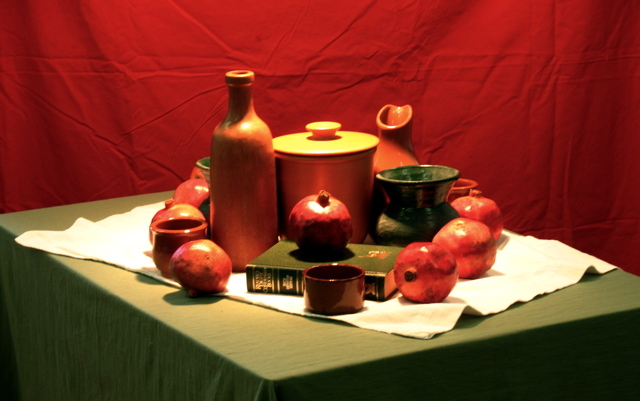 I lightly sketched an area of the still-life before deciding where I wanted to focus. I framed that area with pencil lines and shaded the main shadows within it. 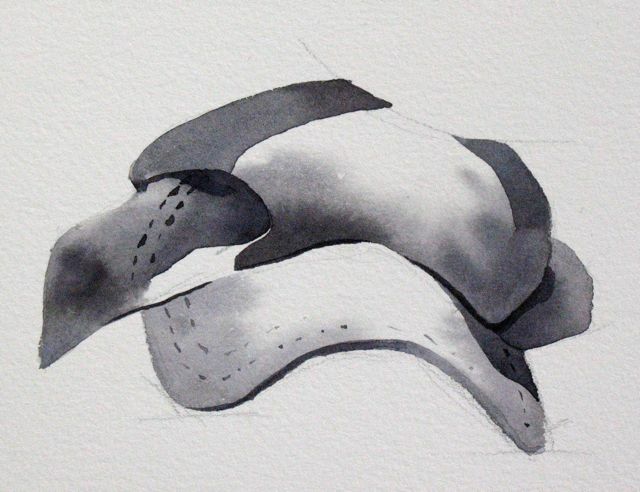 My next step was to enlarge the thumbnail on my watercolour paper while maintaining the same proportions as the sketch. This was a new concept to many of the students. 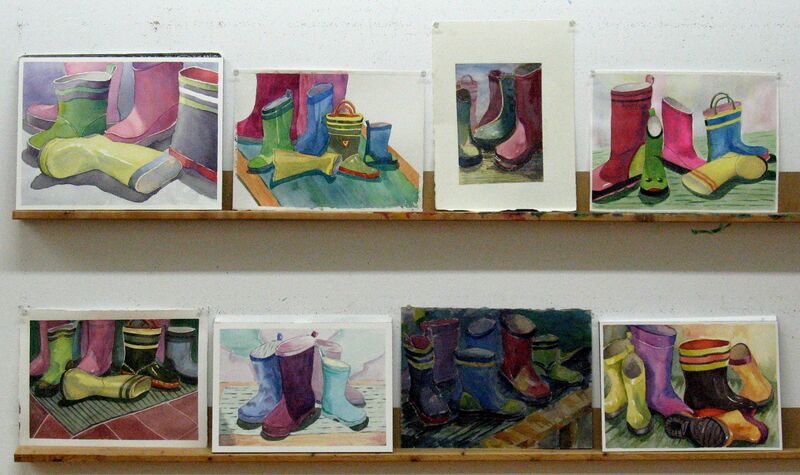 They worked hard on their thumbnails and on transferring the compositions to their larger watercolour sheets. 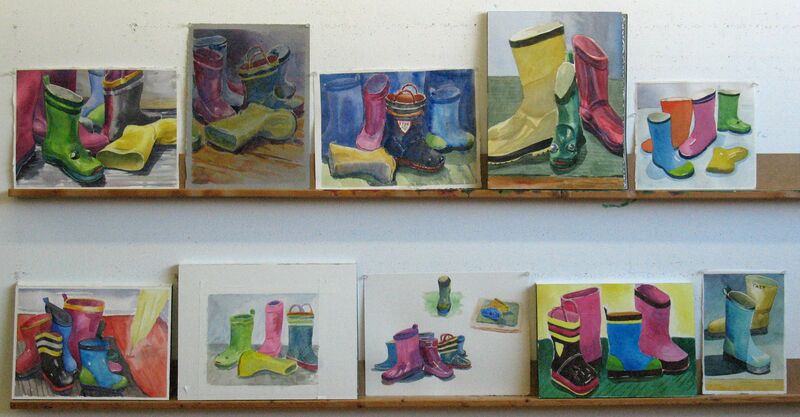 The process slowed some of them down a bit and not all finished their watercolours. I didn’t mind that at all. As they incorporate thumbnails into their practice, they’ll become quicker and more assured. At the end of the evening, we looked at the paintings in two batches. See you next Wednesday! Barry Coombs will be offering weekday and weekend classes at Arts on Adrian in the fall of 2016. Classes are limited to twelve students, unless otherwise noted. Material lists are provided upon registration. Demonstrations, individual attention and constructive critiques are employed in all classes. The studio is accessible by transit and free parking is available. The studio is on the second floor and is not wheelchair-accessible. ***Please, note that the studio is solvent and scent-free! 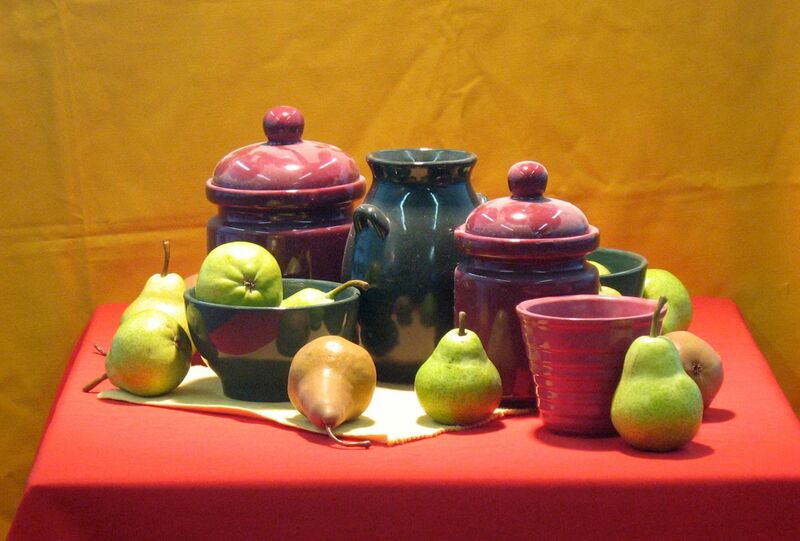 Click here to view demonstrations from Barry’s classes and workshops. This is an intermediate level course. 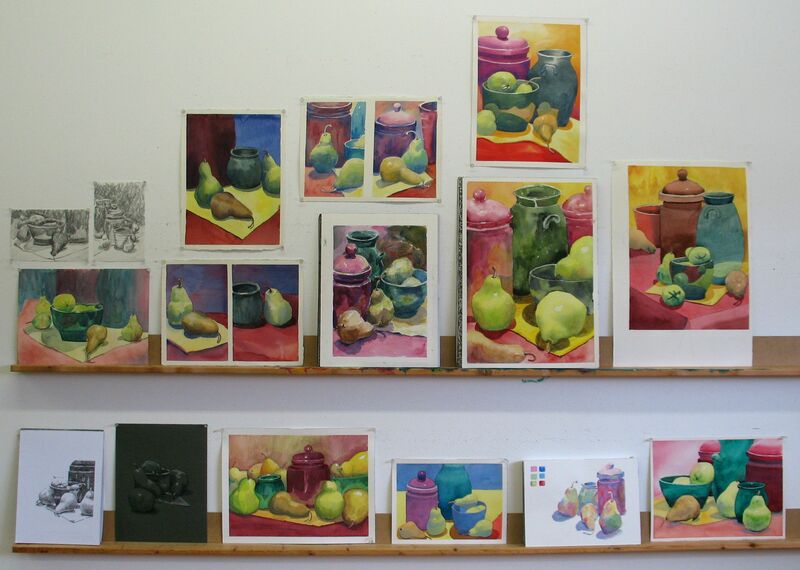 It includes instruction in watercolour technique, drawing concepts, colour and composition. Masters of the medium, historic and contemporary, are examined. Personal development is stressed. 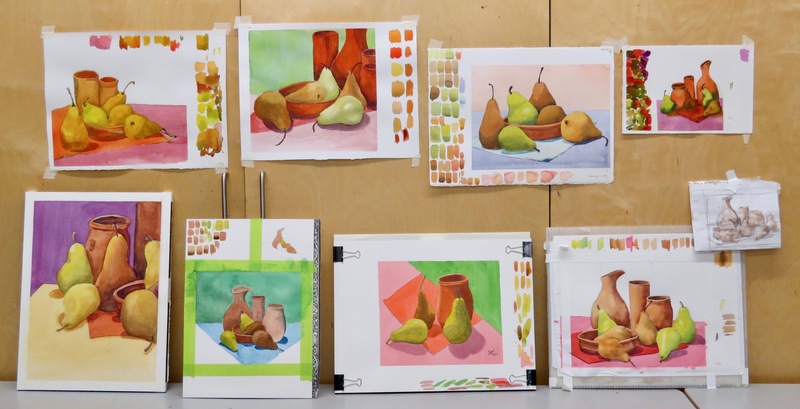 This course is also suitable for students wishing to work in pencil, pen and ink or pen and wash.
Pre-requisite: a beginner watercolour course or equivalent experience. Students are not required to enroll for all of the classes in a term. Individual classes may be selected but please read the registration information below. Enrolment is guaranteed only when your cheque or etransfer is received. 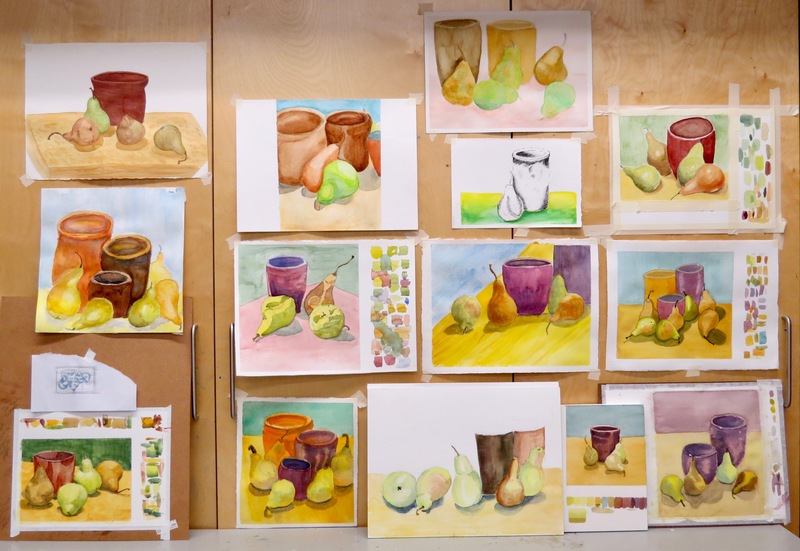 Students work from the still-life in watercolour, pencil, pen and ink or any combination of these media. Watercolour painters may use a maximum size of 15 x 22″ (half sheet). This is an opportunity to work at a comfortable pace and develop a sustained image. 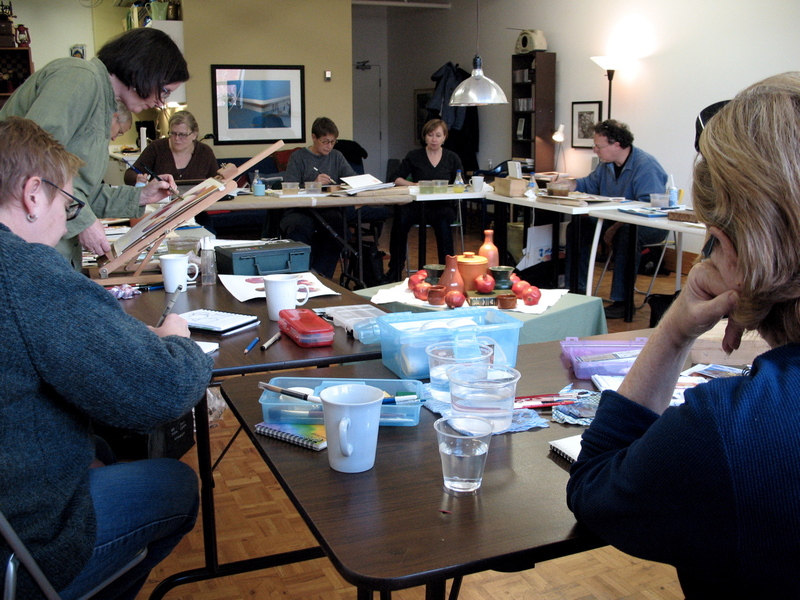 Pre-requisite: a beginner course or equivalent experience in watercolour, pen and ink or drawing. To confirm a place in a class, please email Barry at info@barrycoombs.ca. Registrations are first-come, first-serve. Enrolment is guaranteed only when your cheque or etransfer is received. You will receive a full refund if you notify me of your cancellation more than 36 hours before any class or workshop. If you give me less than 36 hours notice, I will not refund the fee unless I can fill the spot from the waiting list. What’s in a background? 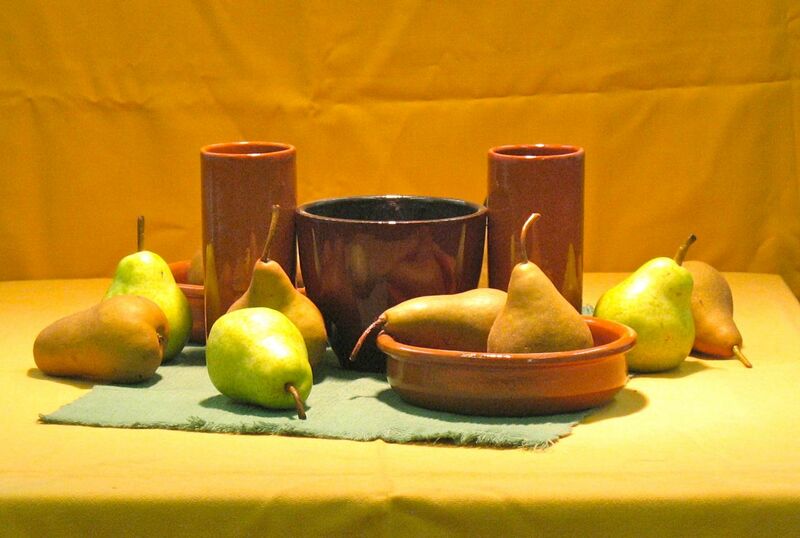 This is the same photo of the still life that I showed you on Saturday. I selected the green fabric in order to enhance the objects. This, however, isn’t what my students see while they’re painting. They don’t see any sort of backdrop. This is what they see; minus the other students across the room from them. Now, you know why you see different background colours and treatments in the student watercolours. 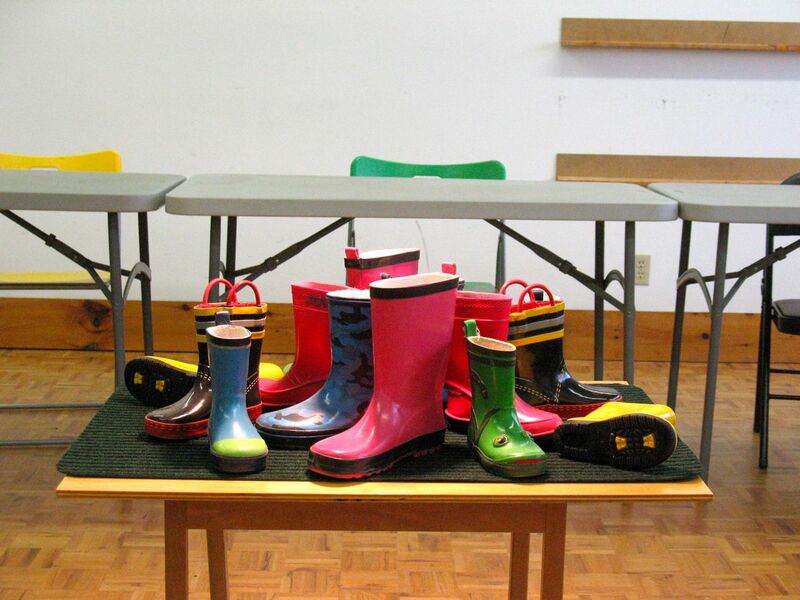 Have another look at the last Sustained Saturday Critique and you’ll find some very imaginative and vibrant solutions. You might even think that no-one ever asks me for a suggestion about the background in their painting. You’d be wrong. I’m always hearing ‘I don’t know what to do. What do you think I should do?’ Well, I don’t tell them what to do. What we do is review our options. Light or dark? Cool or warm? There are so many things to consider. 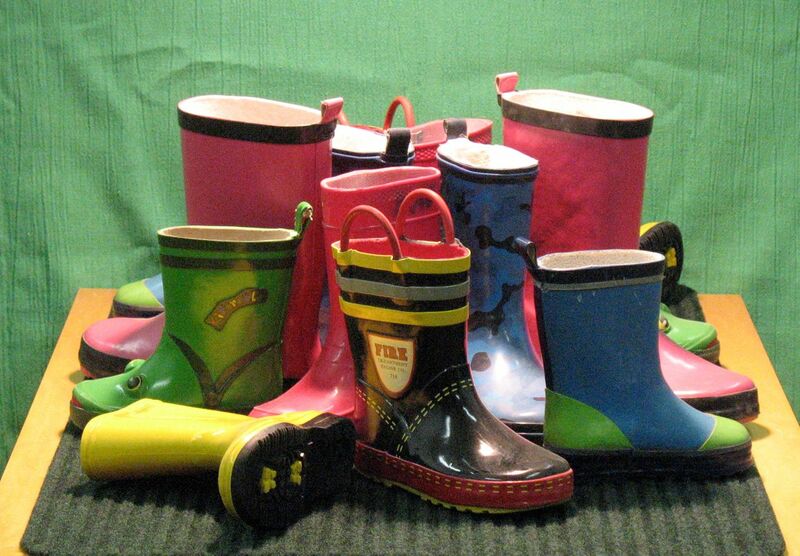 Let’s have a look at some different background colours with the boots. WHITE – Like the watercolour paper itself. Doesn’t do much for me. I prefer the green shown above. ORANGE – Hmmm. I like it better than the white but does it complement or otherwise relate to any of the colours in the boots? PURPLE – This is the darkest and coolest of the choices, so far. It seems to set off the various warm colours to good advantage. I like it. What do you think? 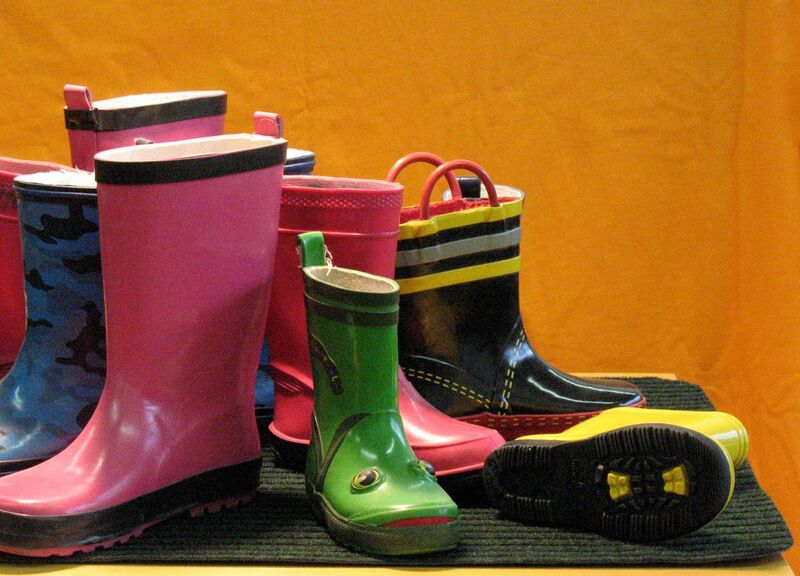 All we’ve discussed is choice of colour. What about grading the wash from light to dark? Or adding a window or some other familiar element? We’re just getting started but that’s enough for now. It’s time to talk about my Tuesday demonstration sheet. Once again, I referred to the Saturday class. I talked about colour choices, simplification and process. 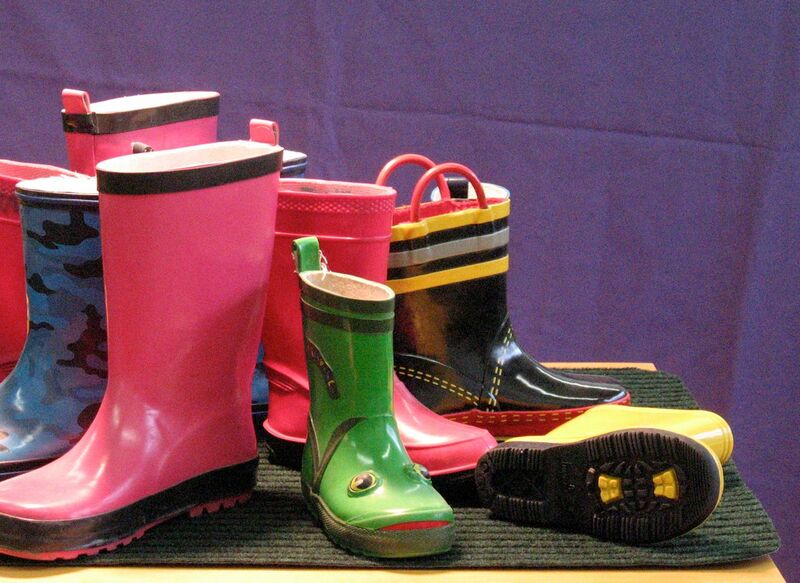 In some cases, it might be a good idea to paint the entire shape of a boot before letting it dry and glazing other colours over it. In the upper left corner, I painted a green shape. Next, I added the pure Cobalt Blue (see the swatch to the left of the boot). I ended up with dark green and not blue. 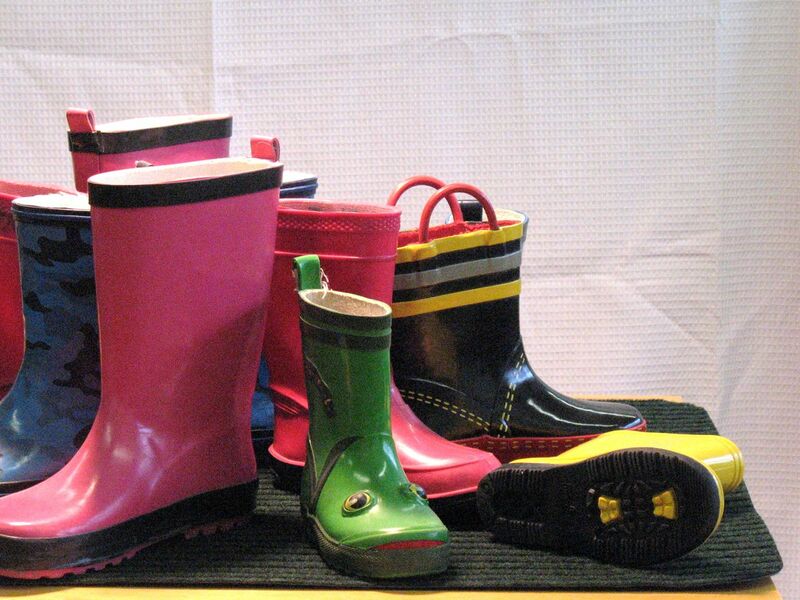 With the boot on the right, I looked at it’s component shapes and painted them one at a time. This allowed for more control of the washes, particularly when soft edges were desired. It also gave me a blue and green boot. The Tuesday students have only half the painting time of the Saturday students. Wisely, most of them kept their backgrounds simple but there are still some very effective treatments. Tuesday Watercolour Class – Week Five! Soft forms. So far this term we’ve painted pears, cardboard boxes, metal containers and pumpkins. 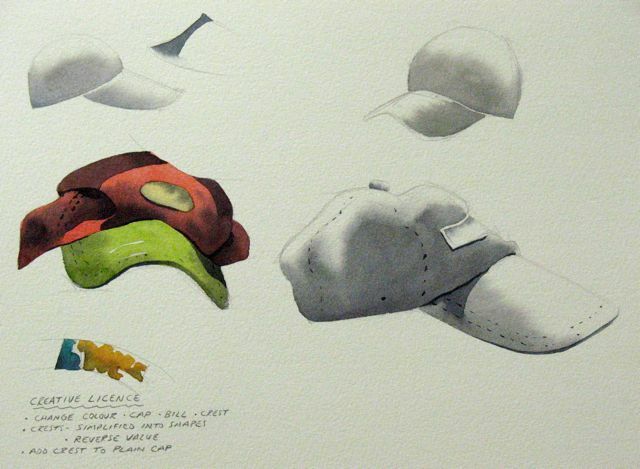 It was time for the challenge of soft forms and these ball caps were ready to go to work. But, what is the strange, rumpled creature shown below in greys? It’s a partially squished ball cap and I used it to discuss value, soft-edge techniques and brush-handling. In the full demonstration sheet, I’ve added colour and that helps to tie it together. I wouldn’t make this cap the focal point in a painting. 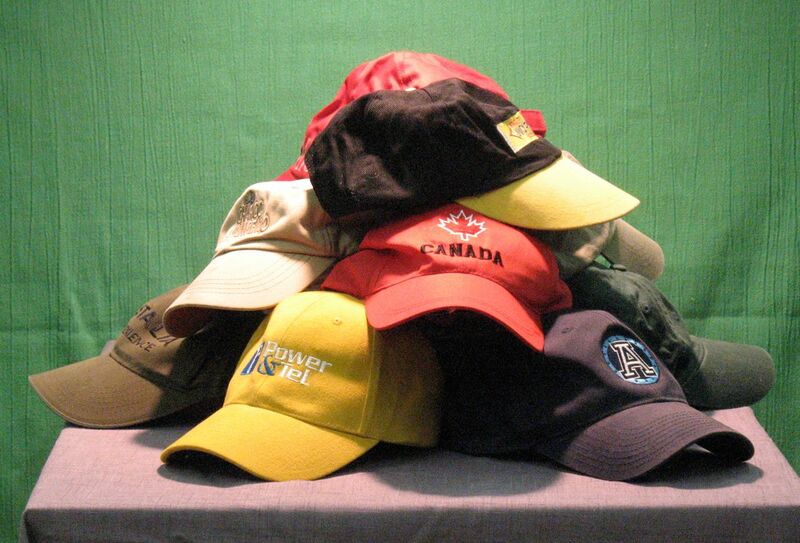 For that, I’d choose a cap more in profile and easier to understand at a glance. My crumpled cap would serve better as a ‘best supporting actor’. We also discussed a few thoughts about creative licence which I printed on the full demonstration sheet. 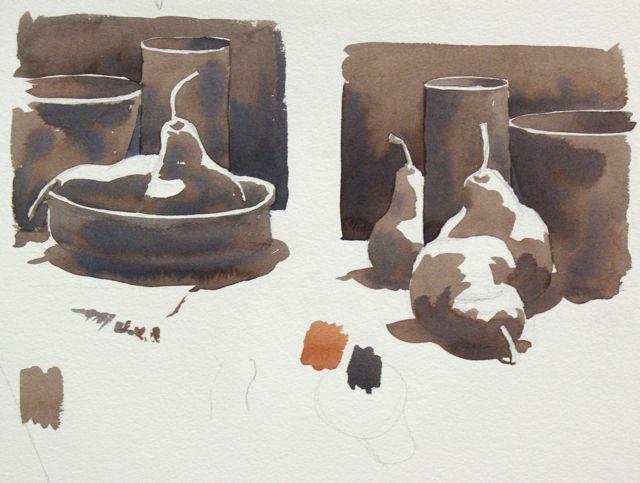 Almost all of the students chose to develop the values in grey before adding colour with thin washes. 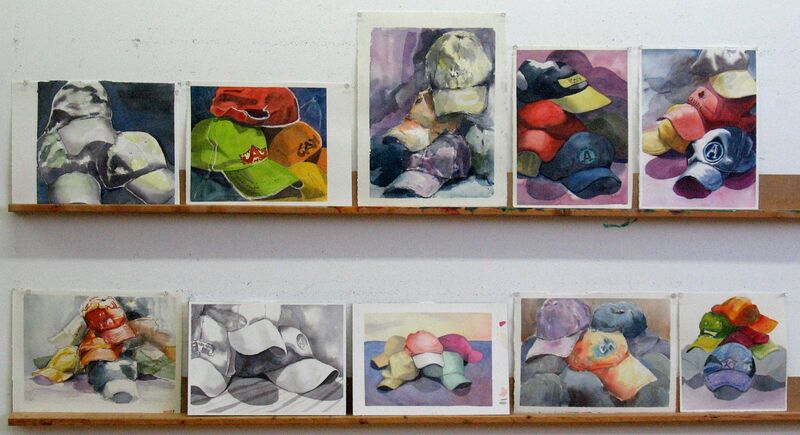 The ball caps are an unusual subject but a lot was learned from them and the results are very dramatic. We’re back in action! It was great to see all of the regulars and to meet my new students yesterday. I decided to get back to basics and suggested that value and light and shadow be our focus. 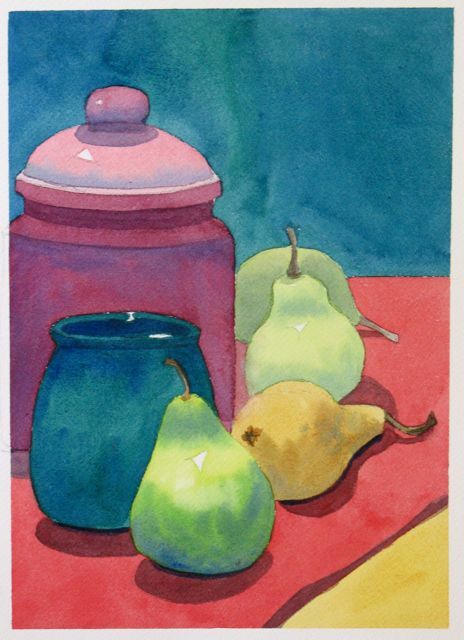 My demonstration is on a quarter sheet (11 x 15″) of Curry’s, 200 lb., Cold Press paper. I used a #10 round watercolour brush and two colours, Burnt Sienna and Cobalt Blue (from Da Vinci). I stressed simplification of form and careful observation of direct light. My demonstrations are always suggestions. Yesterday, almost all of the students followed my lead. 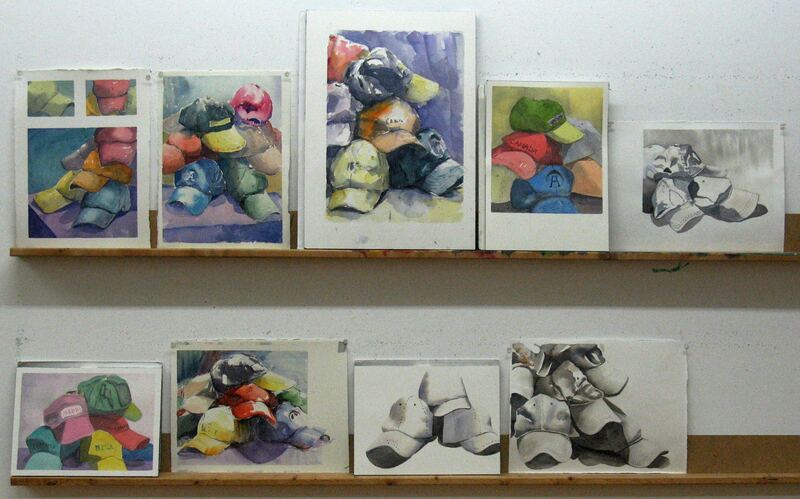 Many did two works; a value study and a colour study. After a long summer, it wasn’t a bad idea to concentrate on the basics. Have a look at their work. I think we’re going to see some exciting watercolour paintings in the months ahead. Sustained Saturday – Watercolour Plus! The Saturday regulars were back for a full day of watercolour painting. 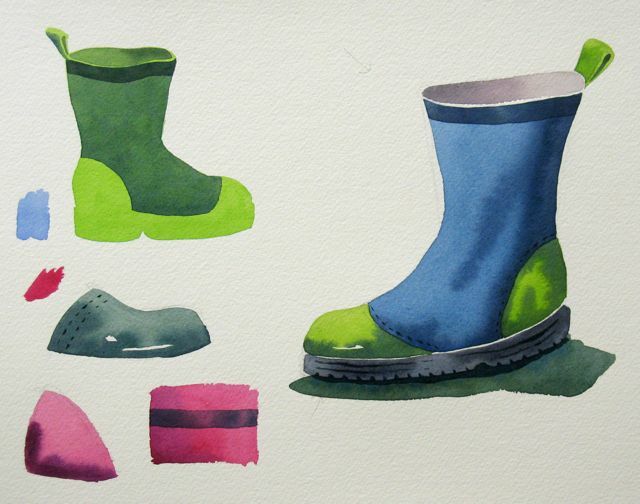 Watercolour is our primary focus but some very nice drawings were created, as well. I talked about simplification and discussed a few brush-handling techniques while painting my demonstration sheet. 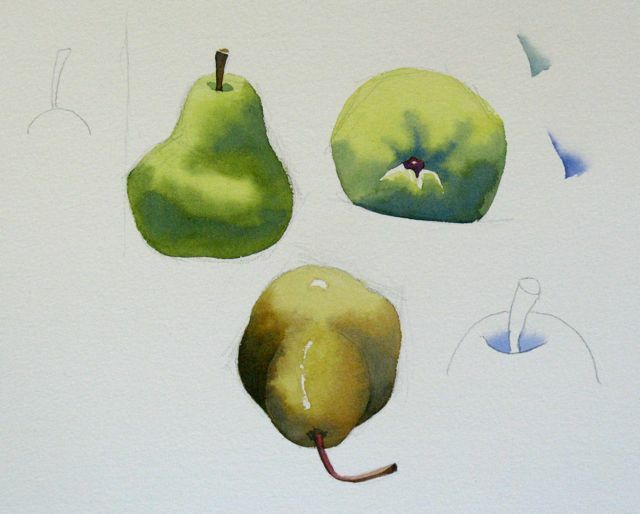 It’s important to understand the forms of the pears when you paint them. How is the light hitting them? Do the core shadows describe the objects? The Saturday students always apply themselves to the task at hand with great enthusiasm. It’s not all hard work, though. We had a lot of fun and it’s very nice to see them leave with smiles on their faces. I’ve got one more watercolour to show you. I photographed it separately because the artist, Jane Dalton, had to leave a bit early. I’ve know Jane for a long time but life and work commitments took her out of the country for several years. She’s been getting back into watercolour painting recently and doing very well. Thanks for your comments, likes and for following our efforts.